More Thai Cafe Baskets, Please! On the 10th of July, I spent all day packing, putting more music on my iPod and sorting photos. Instead of taking all the old photos I'd been sorting, I decided to make collages in the printer/copier and photocopy them. That worked rather well. The next day, my dad and I drove to Nashville! 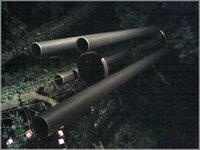 I know many of you have been wanting to read about the trip for a long time. Now you finally can, at least a little bit at a time. We drove to Nashville in eight hours, despite one wrong turn that cost us about 10 minutes. We stopped in Canton at a McDonald's (not included in the time estimate). It was interesting driving through the mountains and experiencing how it leveled off not far into Tennessee. Driving downhill made me somewhat nervous. I've always been queasy whenever I'm in close proximity to large cliffs with signs saying "Falling Rocks". As I've told many of you already, my first words were "I'm afraid of the big rock." Well, driving downhill on a curvy road in a heavy van gives me something else about which to worry. Driving in Nashville reminded me of Boston, for some reason completely unknown to me. I'm really not sure exactly why. The main differences I observed were that there were actual lanes marked on the road and the traffic lights were in the "right" place. For dinner, we went to Tayst, which was similar in many respects to ACME Food & Beverage Co. Once we got to our hotel, I called up my mom and asked her to look up restaurants on Citysearch. I can't remember why I didn't do this myself, but I guess the laptop was still in the van. In any case, she picked out the perfect restaurant for us. 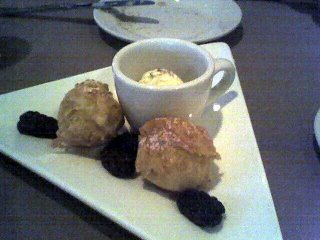 For an appetizer, Dad and I shared "Donuts and Ice Cream", which were shrimp beignets served with bacon ice cream and macerated blackberries. You read that correctly. It was really quite good. I tasted what I thought was a little vinegar on the blackberries, but my dad didn't notice. The beignets were slightly spicy and sweet on the outside. The ice cream was sweet with little pieces of bacon on it. It was wild, but very good. 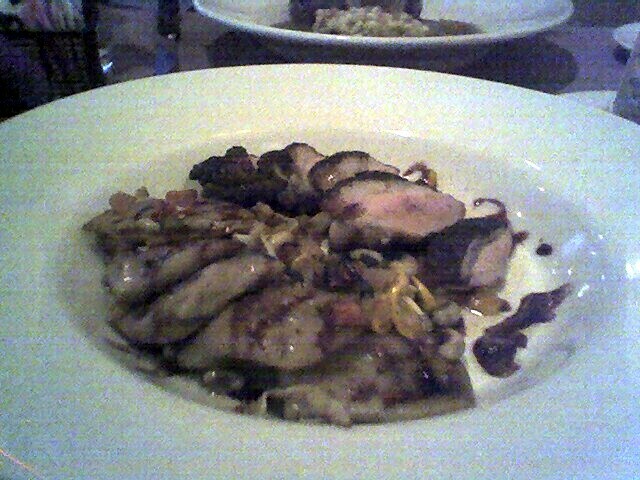 For my entree I had "Duck Duck", which was duck cooked with cherries and duck ravioli, served with spinach and black eyed peas. That was delicious. 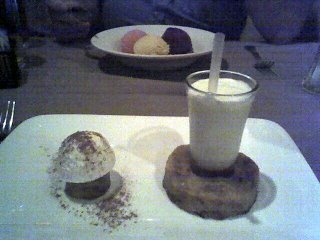 For dessert, I had Krispy Kreme doughnut bread pudding served with a shot glass sized coffee milkshake. I really liked that. So, if you're ever in Nashville and you have the time, you need to go to Tayst. I was pleased with the hotel, the Hampton Inn - At The University, next to Vanderbilt. It was nice and clean and we had two double beds. It was a nice day, my house was all clean and I could have done anything I wanted. I chose to spend all day upgrading to the new Blogger Beta. It was easy to move it, but not so easy to convert my old customizations to something with which I was happy. 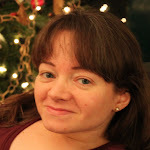 The good thing is that there are several new features, it's easier to add new stuff and I think my photos within my posts are formatted nicely now. On July 4th, I spent the afternoon working on minutes from the previous Durham FM Association meeting and made some earrings. It was nice to have a day off. For dinner, I conducted an experiment that turned out well. I toasted about a third of a bag of coconut in a pan, in the oven. It was set to 360 degrees and I stirred it every few minutes. In the frying pan, I sauteed a few tablespoons of minced garlic. Eventually, I added a few handfuls of pine nuts. I served it with basmati rice, so when the rice was close to ready, I added the juice of one lime, some dried orange peel, thyme, black pepper and thawed cooked shrimp. It wasn't quite enough liquid, so I added a quarter cup of water. When the liquid came to a boil again, I dumped all the toasted coconut with a quarter cup of fresh coarsely chopped mint leaves. My parents, as guinea pigs, seemed to really like it. The rest of the week I furiously tried to get everything done that I could in preparation for being on vacation for two weeks. Amazingly enough, I did manage to leave in time to go to guitar practice that Friday night. There I suggested that we try playing Blownin' in The Wind and Puff the Magic Dragon, two of my favorites. One of the chords I needed to play for Blowin' in the Wind was an F#minor, which is a barre chord and at that point I couldn't play barre chords. HB joined us and we headed for Grasshopper. Grasshopper, one of Bakatsias's restaurants, is extremely hard to get into on a Friday night, so we were lucky. It's even harder to get a decent parking space there, but we managed, after some negotiating. JA and I ordered summer rolls. JJ and I ordered calamari, which was excellent. 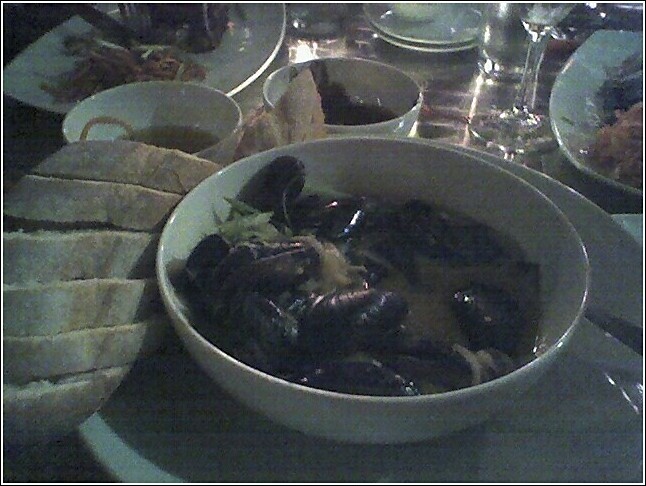 For my entree, I ordered mussles and the pork ribs appetizer. Both were wonderful, but it was way too much food for me. Well, at little too much, at least. The windchimes were right above and behind my head. That Saturday, July 8th, I spent most of the day wrapping presents and washing dishes. It was AE's birthday, so I had to wrap the earrings I made for her the previous weekend. I also wrapped a remote control dalek that I was planning to give GM as a going-away/very early birthday present. I wrapped the dalek in equations wrapping paper that I got from Think Geek. Of course, I got the dalek from Think Geek, too. 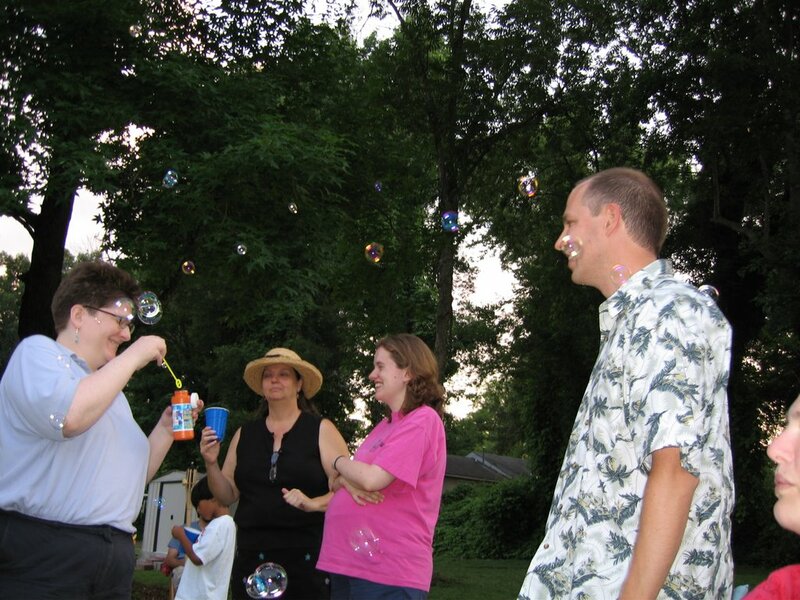 I picked up AE and KD and we went to the barbecue in JB and EG's neighbor, JA's, back yard. It was JA's birthday, too. The weather was fantastic. We played four Gamewright card games, Loot, Wig Out, Moose in the House and Sleeping Queens. The last one was the most creative and complicated. All these are games have such great and elaborate illustrations. EG's friend from highschool, L, played cards with us. As you can see, we also had fun with bubble soap. 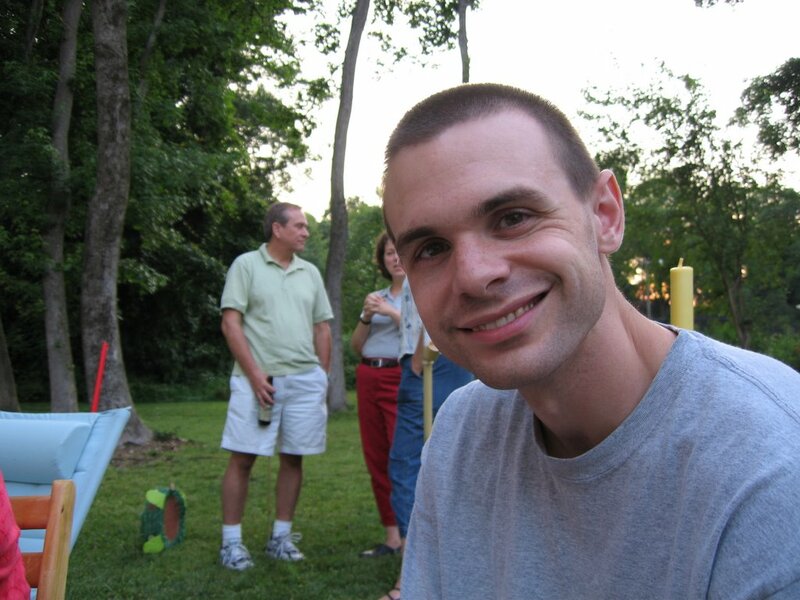 JB was eager to be featured in another blog post and GL, the owner of Shade Tree Coffee, is standing behind him. As we were leaving, GM and I said our farewells, since I was leaving that Tuesday and he was moving to Charleston on Wednesday. Finally, after all that, we decided to all have lunch the next day. The next day, I met GM and AE at Madhatter's Bake Shop for lunch. GM had played the oboe at his church that morning and the congregation has been going to Madhatter's and other local restaurants for a while. I had eggs benedict, which was good, but the yolks were overcooked. My cappuchino was very good. Afterwards, we went to Southpointe and saw Pirates of the Carribean: Dead Man's Chest. It was good and entertaining, but not nearly as good as the original. GM and I said our farewells for the second and last time and then I headed home so I could go to Nantucket Cafe and Grill for dinner, with my parents. I had fish and chips and it was good. I have to take to take a break from recounting meal after meal to reflect on the 5th anniversary of a day that few of us will forget. I will always remember sitting in my van, listening to my cell phone as my mom told me the news. I will always remember going back out to my van with JJ to listen to NPR, because there was no other way to get information. I remember feeling angry, but not at terrorists. At the time, I felt that the people who had done such a thing had been provoked. If I thought that then, you can imagine what I think now. I couldn't fathom how a bunch of madmen could do so much damage to so many lives, our government and our country as a whole. I certainly couldn't imagine how they could be elected for a second term. I remember the sadness of watching the families searching hopelessly for their loved ones. As I've mentioned on this blog before, people rarely comment on how close to as many people have died as a result of the military action in comparison to 9/11. Just as we saw the families searching for some of the 2997 who died that day, there are families mourning the loss of 2761 service men and women. Dare I ask for what? Their families shouldn't have had to ask. The families of the the thousands upon thousands of Iraqis shouldn't have had to either. Let's just hope that the families that are left wake up before it's too late. On July 2nd, my Dad and I tried out the BR-3 OBDII cable that he'd ordered for my van. I'd been having trouble with my Service Engine Soon light coming on and we weren't entirely sure what the problem was. When he took my van in to be serviced, they just cleared the code and didn't seem to think it was worth worrying about. It's nice to have one's own equipment to read and clear the code, instead of paying $40-$60 each time, especially when it comes on every few days. This one hooks right up to my laptop, which is pretty nifty. We'd thought that the code it might be the oxygen sensor, but it was the mass air sensor. Over a couple of months, my van started running more and more roughly and wasn't very peppy. My dad read later that you can actually clean the extremely tiny sensor, which he did last weekend. That seems to have done the trick. It's running very smoothly and it likes merging into high speed traffic again. The trouble light hasn't come on again since he cleaned it either. After playing with the van that day, I organized more elderly photos and made some earrings for AE, for her birthday. They turned out rather nicely. My parents and I went to ACME Food & Beverage Co. for dinner. 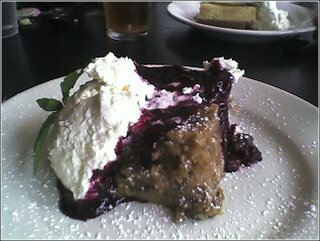 I had a "small plate" of fried oysters followed by superb caramel and cinnamon bread pudding with cherry compote sauce and whipped cream. It was so good. When we got home, we watched my second Netflix movie, Walk the Line. It was about the lives of Johnny Cash and June Carter and I thought it was quite good. 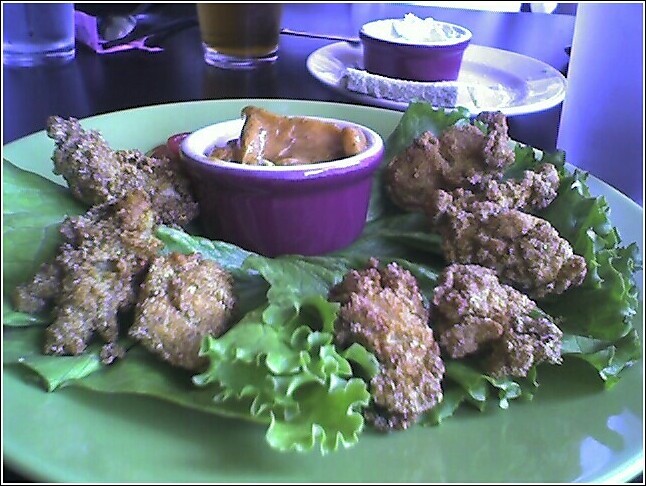 That Monday, several of us struggled to find a place to eat lunch, since it was so close to the holiday. The Refectory was only serving coffee. Twinnie's was closed. We went to the Loop, but due to Bryan Center Walkway construction, the only way to get in was through the Great Hall and through seemingly thousands of TIP kids and campers. We did make it, though, and I had a bean burger that was pretty good. I met AE for dinner and we'd planned to go to Chai's, but it and everything in the complex were closed. We went to Shanghai and shared a serving of Orange Shrimp, which was excellent. A guy stopped by my table, G, who I'd known from the Duke Crafts Center metalsmithing class that I took twelve years ago. That was cool. Afterwards, AE and I went to Kroger and I bought a few things, including a pint of Cherry Garcia Frozen Yogurt, which I have yet to open. I'm just not one to snack in between meals and I need to remember that when I go shopping. I need to invite over hungry people to help me clean out my freezer. Any volunteers? I promise to *try* not feed anyone anything over a year old. I guess I better eat that turkey before November. On June 26th, after a delightful meal of Kurama take-out sushi, my parents and I watched our first Netflix movie, March of the Penguins. It was good and I learned a great deal about penguins. I know my dear readers are shocked. Afterwards, I booked the last hotel for our trip to Arkansas. The next (very rainy) day I had lunch at the Refectory with NP and KS joined us. I had a wonderful serving of vegetarian quiche. I really like quiche. NP and I had a fun time trying to get back to Perkins without drowning. That was probably one of the best times I've had while getting soaked in the rain that I can remember. I was also able to water my plants with the contents of my sandals when I got back to my office. After work, my dad and I met RG and JG at the Bennett Pointe Grille. I had my usual fried oyster salad, but I didn't come close to finishing it, because I'd eaten half of a Guglhupf cherry cheese danish around 3pm. We went to the Durham FM Association board meeting afterwards. That Wednesday, I was over at the American Tobacco Campus for our regular Blackboard Tech Team meeting, which only lasted 20 minutes. I had lunch with AE at Tyler's. I had a blackened crabcake sandwich, which was ok. AE had a salad that looked very good and I'll have to remember to try one the next time I go there. That night, I went over to my parents' house where my mom served chicken and mozzarella ravioli with caramelized onions and warm tomatoes. That was quite good and it was nice to see FIFO. On Thursday, I met my dad for lunch at the LSRC cafeteria. I had spanakopita, which is what I used to eat more than anything else when I ate there as a student. RP ate with us and PA joined us later on. After work, I met PS, GA, EB, CL and JL at Champa. I had my usual Pad Thai with shrimp. I still prefer their version to any other Thai restaurant that I've been to. CL and JL told us all about their recent trip to Greece and Italy while RS told us about her trip to Romania. That Friday, LA and I went to the Refectory for lunch and I had a puffed pastry with chicken and a cheese at least similar to feta. It was good, but I've liked most of their other dishes better. After work, I met AE at Nosh, for dinner. I had a delicious cup of gazpacho and we shared a brownie for dessert. On Saturday (July 1st, if you're keeping track), I went over to my parents' house and I visited with FIFO and blogged while my mom made three skirts for me. 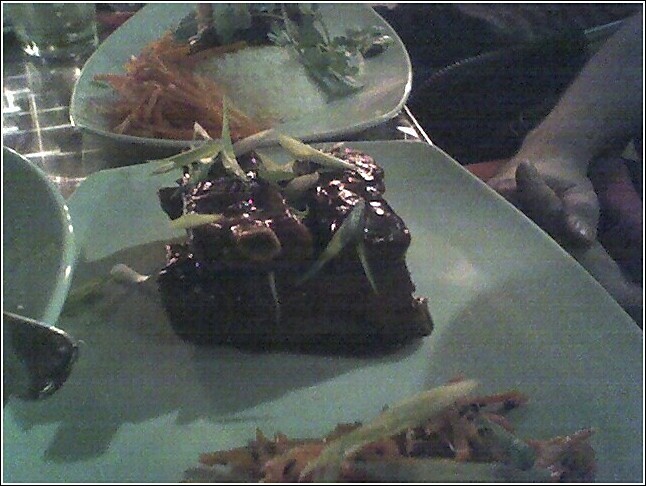 We then went to Thai Cafe for dinner. Almost every time I go there for dinner, I see people I know. That night I saw KP and met her husband, I saw SG and met his wife and I saw NS and her husband in the parking lot, from a distance. You would think there were a lot fewer restaurants in Durham at that rate. For dinner we shared an order of potstickers in a wonderful curry sauce, Thai Cafe baskets, and fresh basil rolls. In the photo, you can see the baskets and the potstickers behind them. 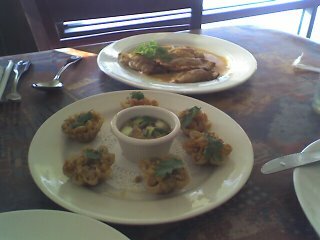 Thai Cafe baskets are fantastic puffed pastry cups filled with shrimp, chicken and corn. They are served with a sweet and tangy sauce. My mom ordered pad thai with shrimp and my dad and I shared an order of shrimp massaman. 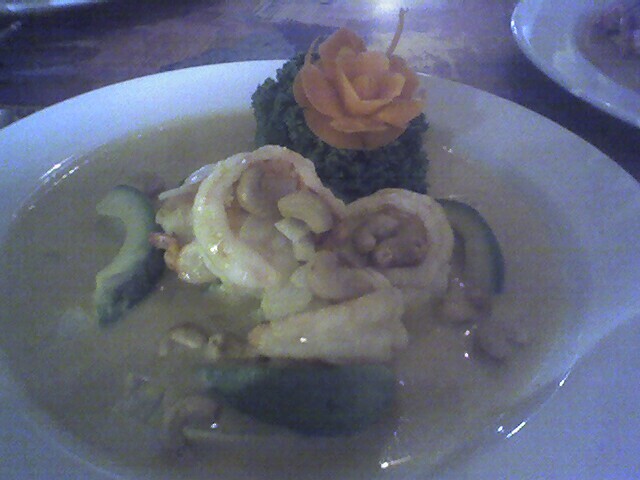 Below a picture of the shrimp from a previous meal, which I'd forgotten to post. For dessert we shared a slice of coconut cake and an order of creme brulee. I liked the creme brulee the best of the two, but I'd really rather skip dessert and eat more Thai Cafe baskets.